Enjoy your meals on the large private patio and seating area with a table, BBQ grill, swing right alongside the creek. This room connects to King Room E for the perfect family reunion or group getaway. 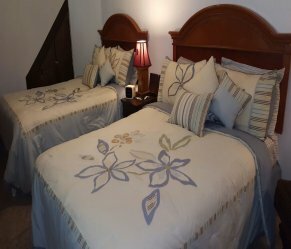 Sleeps up to 6 people only( 4 adults, 2 children or 6 adults)- Newly Renovated. Very private. 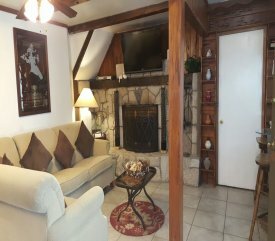 2 Spacious Bedrooms, Living Room, Full-Equipped Open Kitchen, Dining Area, LCD-HD TV's 42" w/cable & DVD Player, Free WIFI Access, Ceiling Fans on all rooms. 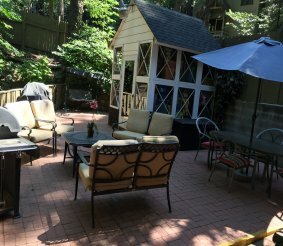 Large Private Patio w/table & Swing, BBQ, alongside the creek.